You've not experienced Sydney CBD massage until you've been to Vitality Charm - the only Broadway Asian massage parlour worthy in our view. This stunningly beautiful centre has to be seen, even if it is a bit out of your way. Spacious rooms, firm massage tables, fully tiled ensuite showers (big enough for two! 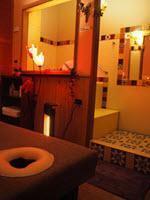 ), and kept scrupuously clean - this is one of the most elegant massage clinics in the whole of Sydney. Such a beautiful setting attracts the most beautiful masseuses, but only the most skilled get their hands on the customers!